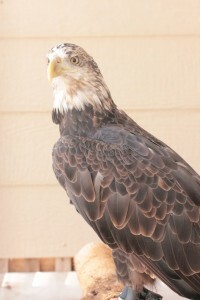 Woody is a bald eagle from Belcow Lake near Chandler,OK. His parents built his nest in a dead tree in the middle of the lake. This tree was blown over in a storm. With the help of the lake ranger, we were able to rescue Woody from the piece of driftwood he was floating on. The facility built him a platform to get him back to his parents, but unfortunately he jumped off of it and broke his wing making him non-releasable. Woody has been in the education program for several years and has taught thousands of people about eagles and our program. RB is a golden eagle from Price, Utah. While he was in Utah he was gunshot and entered rehabilitation. His injury resulted in the tip of his wing being lost, so he is unable to fly long distances making him non-releasable. RB has been a part of our program for approximately 5 years and has traveled all over the state of Oklahoma. 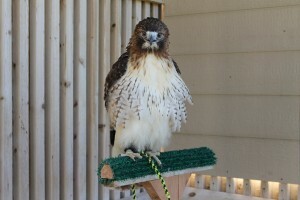 Ann and Andy are unreleaseable red-tailed hawks. Ann and Andy were in the process of hatching from their eggs when the tree that they were in was cut down. Unfortunately, by the time they were in our care, they were imprinted on people. This a serious situation in which the individual does not realize that they are a bird instead of a person since a person fed them through their developmental stage. 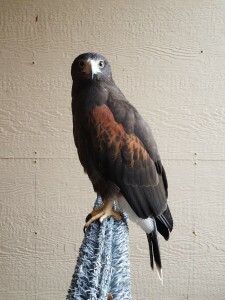 As the bird would not associate with other birds of its species and would rather be around people, imprinting can make the bird dangerous in wild situations. 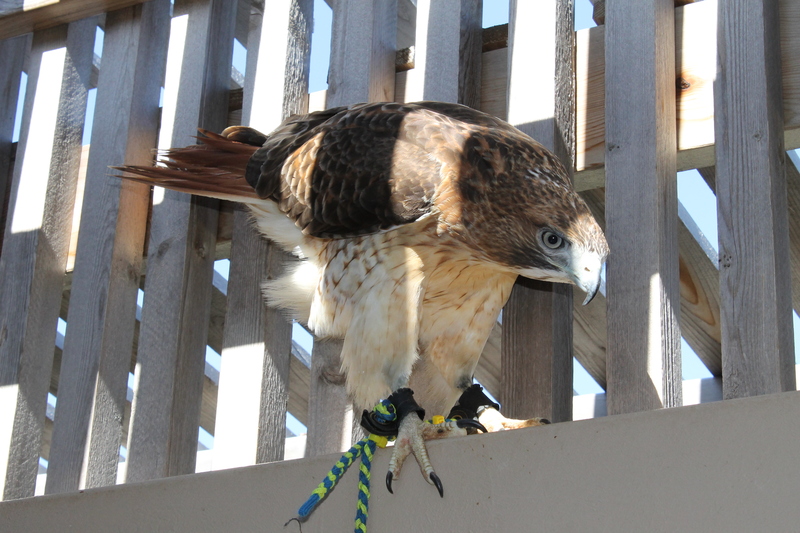 Ann and Andy do well in our education program and just started their journey teaching people about red-tails. Buddah is a barred owl from the Perkins, Oklahoma area. Buddah was brought to our facility by a good samaritan as a hatchling. 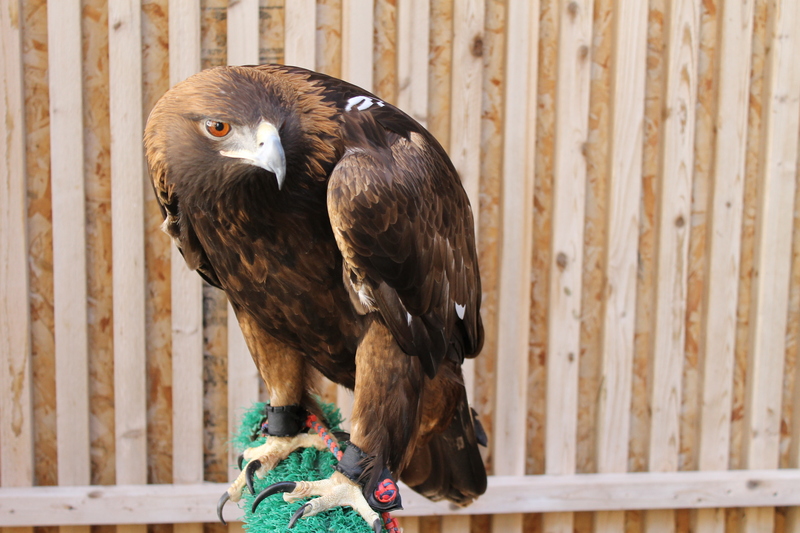 His injury, a dislocated shoulder, did not heal properly so he cannot fly long distances. 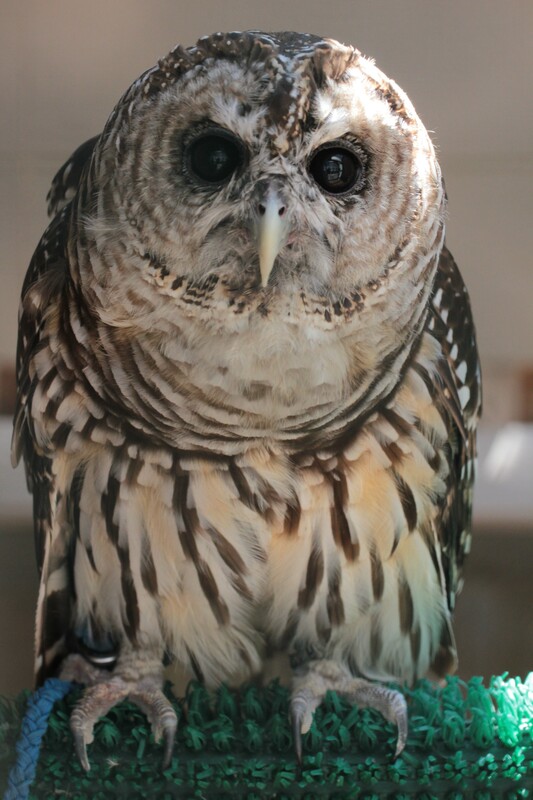 While Buddah’s training took a long time, Buddah is one of the stars of our education program as he is the only owl! Lady is a Harlan’s red-tailed hawk. She was hit by a car in the Tulsa, Oklahoma area and picked up by local rehabilitators. Her wing was broke in the accident and did not heal properly for sustained flight. This is very important for her as her type of red-tailed hawk migrates between Alaska and the Oklahoma area of the US. She will have a long healthy life in our facility. 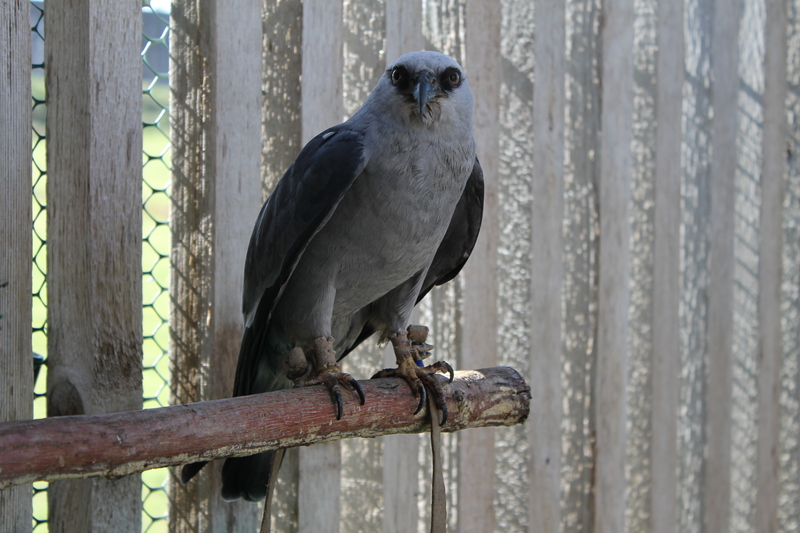 Leah is a Mississippi Kite from Oklahoma. Leah was found by the Highway Patrol during a routine traffic stop. Leah was confiscated by the Highway Patrol as the individual was keeping her as a pet, unfortunately imprinting her. Leah spent time in Tulsa with rehabilitators that used her for education purposes. Leah was transferred back to us after we received our education permits. 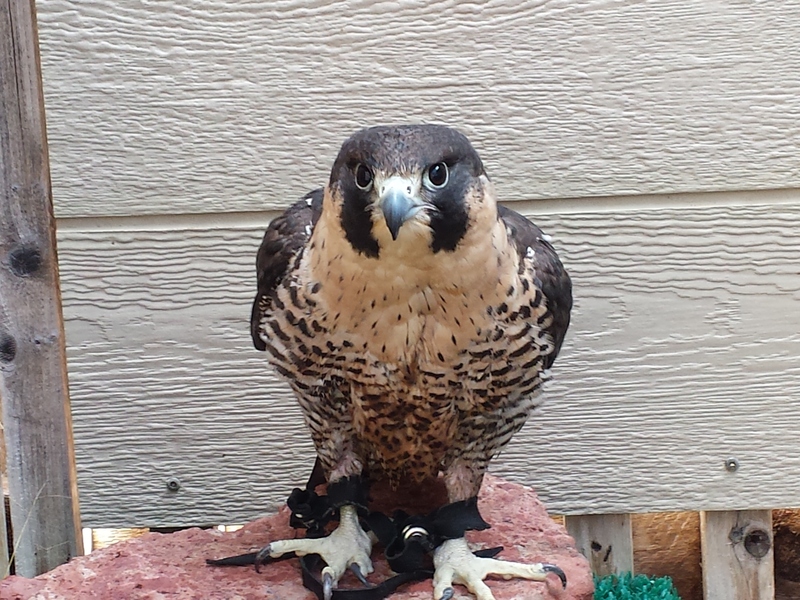 Hannah is a peregrine falcon that was hit by a car in the Tulsa, Oklahoma area during her migration. This accident resulted in a broken wing that did not heal properly. Hannah is one of the senior birds in the education program and has traveled all over the state of Oklahoma to do outreach shows. Since she is a cliff dweller, she has specialized flat perches for her to live on in her cage. 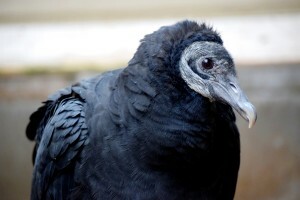 While many people think vultures are “gross”, we think Lola is a beautiful black vulture. Black vultures can be found throughout the southern United States into South America and are slowing expanding their range northward. Unlike the turkey vulture who have a red heads when they are adults, these vultures will keep their black faces throughout their life. 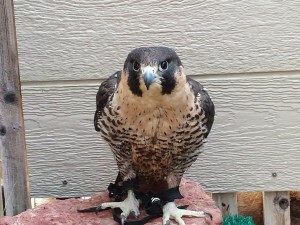 Lola enjoys coming out of her cage and flying from handler to handler during shows. 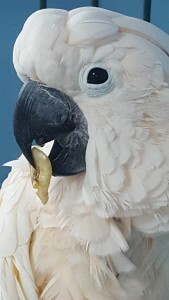 Me rlin is a Moluccan Cockatoo and is one of our non-raptor ambassadors. Moluccan cockatoos can be found in the south Moluccas in eastern Indonesia. There status in the wild is listed as vulnerable as the pet trade caused a decrease in their numbers. While Moluccan’s are beautiful birds they can be very destructive and need proper diet and activities to stay happy and healthy. 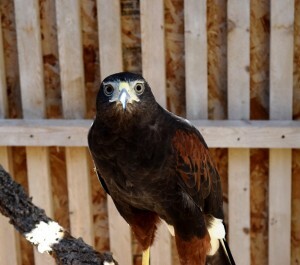 Merlin is extremely intelligent and is provided with many forms of enrichment to keep him entertained during the day. 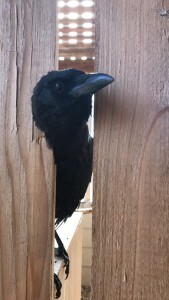 Edgar and Rufio are our resident crows. While they are not raptors, they consistently show the public how intelligent and resourceful corvids are. 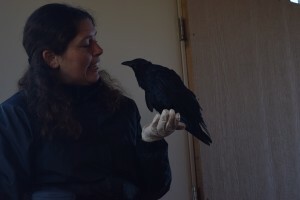 Although some people find crows to be a nuisance, crows can have the intelligence of a seven year old child and can even make and use tools to achieve a goal. Therefore, it is important for them to have enrichment worked into their training routines. Both of these individuals enjoy flying across a stage, showing of their routine. 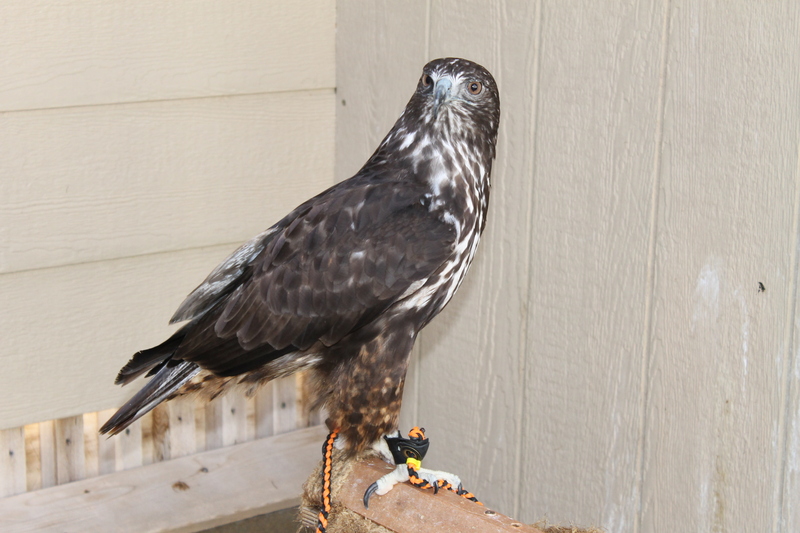 Arroyo and Zephyr are Harris’s Hawks. This species is only found in the very southern portion of the United States, so they are a special treat for many Oklahomans at our shows. In the wild, this species is commonly found in groups and are even known to hunt and nest cooperatively.